Since a few years back, GraftCraft has had the pleasure to cooperate with Smart Textiles, a research institute at the Swedish School of Textiles in Borås. 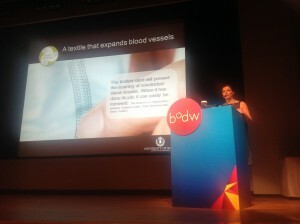 The first week of December, Smart Textiles was invited by the Swedish Foreign Ministry as keynote speaker during Asia’s leading design event, Business of Design Week in Hong Kong having 100,000 visitors. Smart Textiles had the opportunity to demonstrate the Unravelling Stent during an oral presentation. Smart Textiles focused their keynote talk on research in textile design combined with innovation. – Reaching out internationally with our research and our approach is a very important, says Susanne Nejderås, Operations Manager for Smart Textiles in an interview after her presentation in Hong Kong.